⚓ T13062 Trying to manage anything in Gsuite is kind of not great? Trying to manage anything in Gsuite is kind of not great? We use G Suite to manage email for @phacility.com. The email works almost all the time. It also means you automatically get to use the Gmail web UI to access your mail, which is mandated by intergalactic law. The @phacility Twitter email handle is associated with an old email address and I'm trying to update it to something like twitter-phacility@.... 99% (maybe 100%?) of what we actually do with G Suite is set up user email addresses and set up aliases for those addresses. We don't even use lists, just aliases! Creating a new, internet-accessible list with me as a member, like our other lists which already work. Deleting that, then creating aliases for an existing list. Viewing mail to groups in the Groups app instead of via email. I can't get any mail no matter what I try. Every single page takes at least 3 seconds to load. The whole thing is some janky single-page app which frequently shows out-of-date caches in the UI and then updates them a second or two later. Or it doesn't, and I have to reload the page anyway, which only usually works. Deleting two groups worked, but the UI raised a fatal error. Every control seems like a weird, glitchy custom control that doesn't work like it should. The UI breaks the back button. About once a week, IMAP rejects some requests for no apparent reason and sends me 2-3 emails about unauthorized access which don't explain what happened. Actually, I can't even send email to support@ right now, although this worked as recently as yesterday, so maybe this is something like "groups are completely broken even though the status page says they're fine" or "adding an alias can silently break all your groups completely". epriestley triaged this task as Wishlist priority. There's an hourglass icon in the header menu. I don't know what this is for. When I click this, I get a "Loading..." menu which never loads. I reloaded the page, too. There's nothing pertinent in the console error log. Is this icon literally intended to let you access a "Loading..." menu, and the hourglass means "I want to wait patiently..."? I figured some of this might be Safari vs Chrome, even though there's no obvious indication that Safari is having issues (e.g., I didn't catch any JS errors in the console). In Chrome, logging in just took 11 seconds. 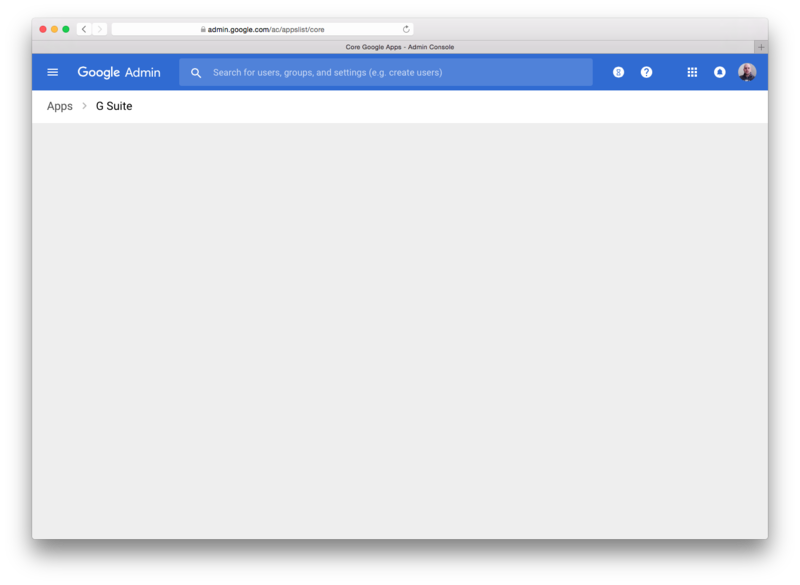 In Chrome, the hourglass menu shows you that you have no "Tasks" after only a couple seconds. I was able to get into "Turn on groups" after about 9 redirects in Chrome, too, and enable them. The UI said "mail will be delivered whether you enable this or not". Enabling them didn't make mail work. Some of this seems to be that messages sent from my @phacility.com address are sometimes eaten entirely (?) or just not delivered to me (? ), presumably because I'm a recipient. I still haven't been able to get the confirmation link from Twitter, but it's possible that's on Twitter's end. I've now spent approximately an hour and a half trying to receive an email. Register or reuse some other domain we have like phacility-lists.com. Set that up with a non-G Suite provider (which) or maybe self-host it (ugh, but maybe?). Move noncritical list/alias mail (AWS, domain contact, account) there. If that works for a while, maybe move primary contact mail. Ah, it looks like Google Groups spam filtered some of the Twitter verification mail! I can't actually follow the link in the mail because Twitter produces a 300+ character long verification URI and Gmail truncates it somewhere around 315 characters with a "..." in the UI, but I think we're closer. If all you're going for are emails, why not spin up your own Exchange server (or whatever the kids use these days)? With maybe forwarding to a epriestley-phacility@gmail.com so you remain compliant? The great things about gsuite, IMHO, is the Google Docs online-realtime-wsywig-collaborative-editing, and maybe gdrive. And gmail, naturally. I'd either want to pay some service to deal with this or run an open source server that I was confident it was possible to fix, but one option is definitely to run Postfix/Dovecot/Exim/whatever the kids use these days. There's some argument for doing this no matter what because we have a small amount of need to receive domain mail for many outlying domains (like phurl.io, javelinjs.com, php-aint-that-bad.horse, etc) and this is inconvenient/impossible with G suite AFAIK. I actually pay for such a service already personally (nearlyfreespech.net) and it has worked flawlessly for ~10 years, so maybe that's a reasonable option. It looks like Amazon has an "Amazon WorkMail" service but it sounds like this is just them running Exchange for you. I'm actually not sure I've ever collaboratively edited a document in a professional context. I sort of know that a lot of people must do this -- e.g., this was basically what Quip was for, and they sold to Salesforce for $750M fairly recently; and Dropbox has made a big push for this -- but I don't really understand why collaborative WYSIWYG editing is useful outside of a very small number of special cases (e.g., doing a programming interview in a collaborative text editor). A major use-case familiar to me: taking meeting notes in a geographically distributed team environment. Google docs can also be used as a sort-of not-code review system for document sign-off or soliciting feedback on something. Oh, right, "meetings". I've heard of those!